How do I instruct ScanSnap Manager to process one scan job as either single- or double-sided? Simplex scans are a one-sided scan. The scanner will capture an image of one side of the document only. Duplex scans are a two-sided scan. The scanner will capture images of both sides of the document. This article provides steps to use controls to instruct ScanSnap Manager to process a single scan job as either one-page (Simplex) or two-page (Duplex). Make sure Quick Menu is disabled. 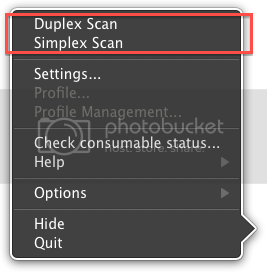 From the top of the contextual menu, select the option (Simplex Scan or Duplex Scan) that you would like to scan with. Note:For more information on ScanSnap Manager (such as how to disable Quick Menu), please see ScanSnap Manager Help. You can reach ScanSnap Manager Help by clicking the ScanSnap Manager button in the Dock, then selecting ScanSnap Manager Help from the Help menu.